First published in the United Kingdom, THE RIVER COTTAGE MEAT BOOK quickly became an underground hit among food cognoscenti around the world. Now tailored for American cooks, this loving, authoritative, and galvanizing ode to good meat is one part manifesto on high-quality, local, and sustainable meat production; two parts guide to choosing and storing meats and fowl; and three parts techniques and recipes for roasting, cooking, barbecuing, preserving, and processing meats and getting the most out of leftovers. With this thought-provoking and practical guide, meat eaters can knowledgeably buy and prepare meat for better health and better living, while supporting the environment, vibrant local economies, and respectful treatment of animals. 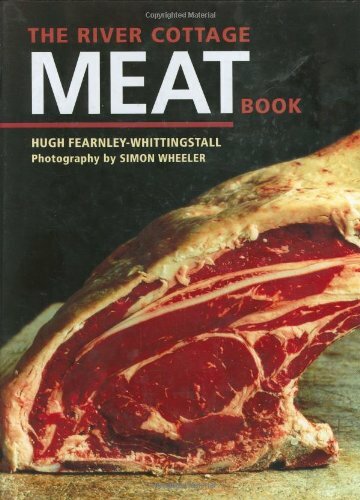 • Already a sensation in the United Kingdom, this groundbreaking treatise on choosing and preparing meat is now available in the United States for the first time. • Includes more than 100 recipes and more than 200 full-color photographs. • Thoughtfully Americanized, with complete information about assorted cuts (including illustrations), production standards, and sources for buying and learning about meats in the United States. • British edition has sold 150,000 copies.